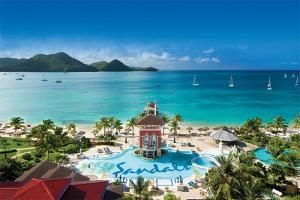 The Sandals Grande St. Lucian is approximately 6 miles (10 minutes) northwest of the town of Castries, on a Causeway between Pigeon Island and Rodney Bay. It is 10 minutes away from SLU, and 90 minutes from UVF. Soufriere, Sulpher Springs, Diamond Falls, Botanical Gardens, Marigot Bay, Rodney Bay, Fort Rodney, Cap Estate, Castries, Marquis Estate, The Maria Islands, Fergate Island Nature Reserve, Dolphin and Whale Watching, Mamiku Gardens and Latilla Falls.